As far as green veggies are concerned, my list previously stopped at broccoli and lettuce. Over the past few months I have tried to add more and now I find myself craving snap peas, zucchini, and spinach. In my search to increase my veggie intake, I came across Kale Chips. Yes…crunchy, salty, kale chips. They are so easy to make and you will find yourself not being able to stop eating them. 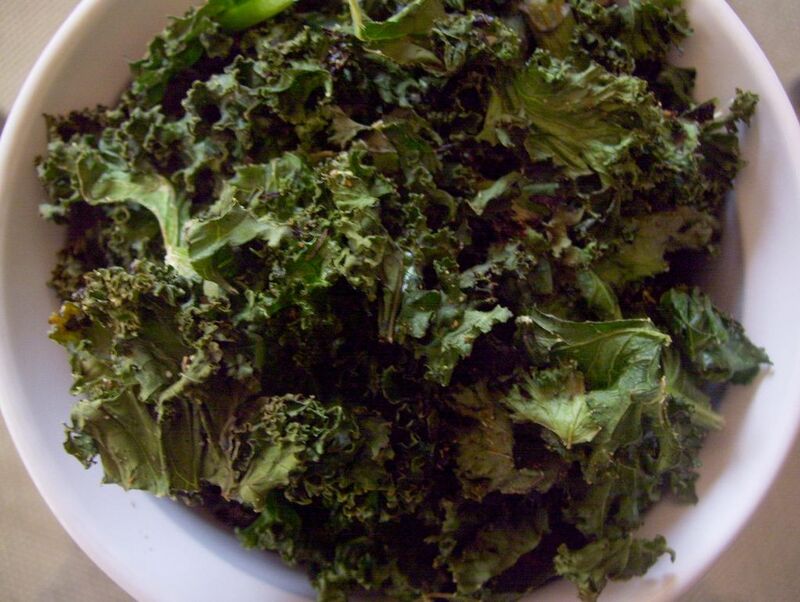 To make Kale Chips, pick out a fresh, organic bunch of kale. I tried using a bag of kale that was already torn into pieces, but it didn’t work at all. Preheat your oven to 350 degrees. Begin by tearing the kale into large pieces (about 3 to 4 times larger than bite size). Toss the pieces into a salad spinner and wash thoroughly. I spin the kale about 3 times because it is very important to make sure they are dry so they will crisp up. Spread the kale pieces on a sheet pan and drizzle with extra virgin olive oil, and salt. Toss them around and place them in the oven for around 12 – 15 minutes. Test them by pulling the sheet pan out and shaking it. If the chips move around then you know they are ready. Go buy some kale and try these now. For real. YUM!